There's a 70% chance of a recurrence of the El Niño weather event before the end of this year, according to the World Meteorological Organisation. The last El Niño occurred in 2015-16 and impacted weather patterns around the world. Researchers say they are not expecting this new one to be as intense as 2015-16. According to the WMO, climate change is influencing the traditional dynamics of these weather events. The El Niño/Southern Oscillation, to give its proper title, is a natural event that involves fluctuating ocean surface temperatures in the Pacific, which influence the weather all over the world. The 2015-16 El Niño was one of the strongest ever recorded, and had an impact on global temperatures, which saw 2016 enter the record books as the warmest year. As well as heat, the event also led to drought in Africa that saw food production plummet in many countries across the continent. South America saw floods across Brazil, Argentina, Paraguay and Uruguay. 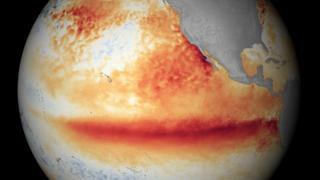 This year started with the opposite to El Niño, the so-called La Niña phase. This saw cooler than average sea-surface temperatures in the Pacific. That has now faded and, according to the WMO models, there's a 70% chance of another El Niño developing by the end of this year. However, it is expected to have less impact than in 2015-16. "WMO does not expect the anticipated El Niño to be as powerful as the 2015-2016 event, but it will still have considerable impacts," said WMO Secretary-General Petteri Taalas. "The advance prediction of this event will help save many lives and considerable economic losses," he added. "2018 started out with a weak La Niña event but its cooling effect was not enough to reduce the overall warming trend which means that this year is on track to be one of the warmest on record." Separately, Japan's weather bureau said there is a 60% chance the El Niño weather pattern emerging during the northern hemisphere autumn from September to November.